We've been lucky enough to have an early Easter egg hunt this year, with these yummy Monty Bojangles Easter Eggs. Ethan was very excited when I told him that for this hunt we would be able to hide the eggs ourselves, but as he is very good at finding things I wanted to make it more of a challenge for him, so I made a treasure map for him to follow! Last year we did a colour coded egg hunt which worked really well for us too, but this was even more of an adventure! I started by making the map for Ethan colour coded, the Monty Bojangles Easter Eggs each come in different brightly coloured boxes so I drew a large turquoise X for the Flutter Scotch Truffle egg, a large yellow X for the Scrumple Nutty egg, a large pink X for the Berry Bubble egg and a large purple X for the Choccy Scoffy egg. 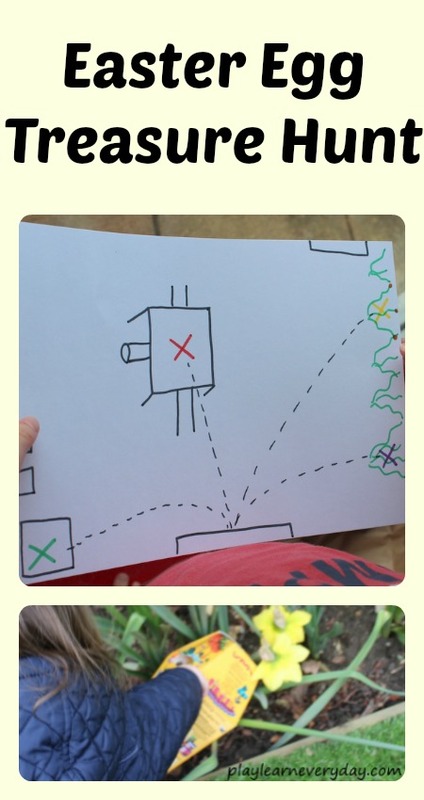 Then I hid the eggs in the garden and sent Ethan off with the map to try to find them. Ivy joined him and just ran around trying to find the eggs, she loved discovering them in all different places and got so excited when she found one! Ethan was able to follow the trail on the map and knew which coloured egg he was looking for, then followed it along to the egg's hiding spot. He was so keen to find the eggs and even made pirate sounds when he did! It was definitely a fun and unique way to have an Easter egg hunt, we'll have to suggest it to the Easter Bunny and get him to make a treasure map for the kids on Easter morning. Of course after the Easter egg hunt we got to sample our treasure! The Monty Bojangles eggs are delicious, they each come with a milk chocolate egg that the kids loved nibbling on and a little bag of truffles which are my favourite, so it was perfect! I tried the Flutter Scotch truffles which are butterscotch and sea salt flavour and they are seriously good, the crunch of the salt goes surprisingly well with the sweetness of the butterscotch flavour, I can't wait to try the other ones!